One of the most recognizable landmarks from one of the world's most romantic cities, the Eiffel Tower is an enchanting symbol of love. And these elegant wine bottle stoppers, part of Fashioncraft's exclusive From Paris with Love Collection of French inspired favors, capture the tower's timeless charm! 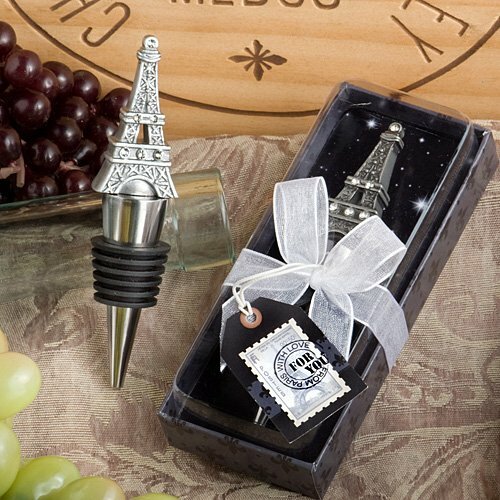 Each wine bottle stopper favor measures 4.25" x 1" and features a detailed pewter colored poly resin Eiffel Tower replica, enhanced with glistening rhinestones, atop a chrome finish silver metal conical base, wrapped with a black rubber gasket for a snug seal. Each comes resting against a starry night design insert background in a clear topped box with a black fleur de lis design charcoal grey base. The box is wrapped with a white organza ribbon and an attached Eiffel Tower postage stamp design "For You" tag.